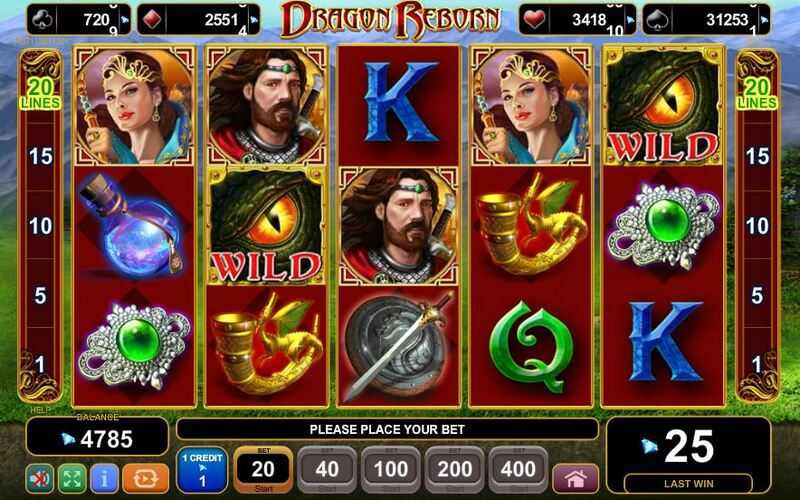 Dragon Reborn slot is an odd name that makes me think EGT had the name 'Dragon Born' in mind until they saw the Big Time Gaming slot of that name. We return to the tried and tested EGT format after their departure with Thumbelina's Dream and despite the name there is no Oriental aspect with this Dragon, more a mythical fantasy one with the reels set in a make-belief countryside scene. So will the Dragon breathe fire into your play? Back with their standard reels we have 5 of them with 3 rows and 20 pay lines. 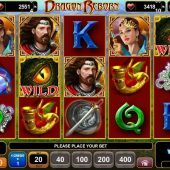 The symbols all appear as singles and the Warrior man is top-pay at 100x bet for the 5-of-a-kind and his Princess pays 50x, followed by the Horn or Shield at 25x and the potion or brooch at 10x. The card values form the rest and pay 7.5 down to 2.5 for the 5. The main action occurs on reels 2 to 5 where you will find the Dragon's Eye Wilds and 2 to 4 where the Dragon's Fire scatters appear. No multiplier on the Wilds but all 3 scatters award some decent free games. You can retrigger it and get a new set of spins to play one the first is complete. The reels are also enhanced for the free games.